Huge stockpiles of weaponry and ammunition, many with NATO markings, were discovered in East Aleppo in late December, when the Al-Nusra militants, a local branch of Al Qaida, were pushed out of the city by Syrian forces. While citizens who fled the intense fighting began returning, Syrian government forces continued to be intensely engaged in efforts to dislodge terrorists from the countryside surrounding Aleppo villages of Khan Al-Assal, Al-Atareb, Kafr Naha, Kafr Dael, Al-Qassimiya, and Dart Izzat in western Aleppo. According to AlMasdar.com and media reports, Russian airstrikes began just days after the Syrian government declared the complete control of Aleppo, preparing the way for Syrian ground troops, who followed up in a sweep of outlying areas necessary to protect the hundreds of thousands of Syrian citizens who had returned to their war-exhausted city. An under-reported development in the surrender of takfiri/terrorist fighters who remained in East Aleppo, and the discovery of the large trove of abandoned weapons, was the location and detainment of over a dozen men identified as NATO/ coalition military officers who were captured in a bunker around December 16. Reported by numerous independent media sources such as Voltaire.org, 21st Century Wire, GlobalResearch.ca, as well as SANA, the actual list of names was announced by Syrian Ambassador to the UN Bashar Al Jaafari following a hasty, unplanned meeting of the UN Security Council on Dec. 16. Mr. Shehabi, European mainstream media and leading politicians are upset about the liberation of Aleppo by the Syrian Arab Army. They wrote reports about massacres committed by the army and horrified civilians in Aleppo. Shehabi – It is the total opposite. The news in Europe is a real problem because they report exactly the opposite of the real facts in Syria. We were able to liberate around 100.000 civilians who were held hostage by terrorists in Aleppo. A lot of them were taken hostage for more than four years. The 1.5 million civilians who left Aleppo since 2012 are now able to come home again. That was a very positive and happy moment for Aleppo and Syria in general. We were able to celebrate Christmas in Aleppo for the first time since 4.5 years…! Shehabi – Yes, but before they left they executed more than hundred Syrian soldiers and hundreds of civilians. We found their bodies. This is all documented. Any international independent investigation can see and check the evidence of these terrorist crimes. 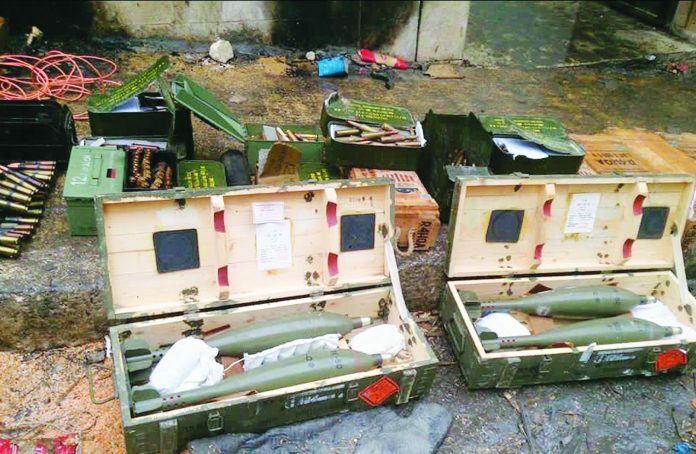 Damascus reported about a huge amount of Western military material such as arms and ammunition in Aleppo. Shehabi – What we found there was whole weaponry warehouses which were put in former school buildings by the terrorist forces. Our schools were turned into Al Qaida military bases. We found at those Al-Nusra bases – Al-Nusra is a branch of Al Qaida – full with NATO weaponry. We found tons of these weapons. I call that “SyriaGate” – the U.S. and NATO arm and support terrorist gangs which are even on the official UN terror list in order to topple the legitimate government of a sovereign country. This is totally ridiculous of the West because nobody can guarantee that these weapons will not be used one day against the West itself by these terrorists. American and European tax payer’s money is abused to arm terrorist gangs which are ready to direct their guns any time against America and European civilians. This is a huge scandal. The fate of Aleppo didn’t play such a big role in Western media for the last 4.5 years. Since the start of the liberation operations of the Syrian Arab Army the situation changed completely: All of the sudden…they accused the Syrian Army of committing “genocide” in Aleppo, of bombarding hospitals, of massacring children and babies. Shehabi – We Syrians paid in blood and destruction. Our own blood is the currency for these Western lies and this “misunderstanding”. Someone in the West can always say “Oh sorry, I got it somehow wrong!”, but we paid with our blood and our lives for this horrible ignorance. Aleppo was conquered by Al Qaida gangs in summer 2012. There were no Aleppo residence involved, our city was very peaceful, no one took the arms against the government. We were conquered by the terrorists with heavy weapons and they took 70 percent of our city. In 2012 around two million civilians lived in East Aleppo, 1.5 million left the occupied territory to safe zones. Nobody in the West spoke about the displacement of these 1.5 million people who were fleeing into government controlled areas. America and Europe were silent. Nobody in the West was interested in the 11.000 civilians killed by the terrorist gangs in four years of random shellings and bombardments. 30 per cent of these killed civilians are children. 4.5 years we were losing innocent civilians by terrorist grenades, explosives and snipers. – There is no other explanation for that behavior. Again: 4.5 years the terrorists brought the hell to the civilians of Aleppo, but the West didn’t care. When we liberate the terrorist controlled areas the West reacts with a huge campaign against us. At the same time the whole Western media campaigns for liberating the Iraqi city of Mosul from the terrorist gangs of the so-called “Islamic State”. Why is it allowed to liberate Mosul, but forbidden to liberate Aleppo? This is a big hypocrisy. I recommend to the Western audience to put themselves in our shoes. Imagine that tens of thousands Al Qaida terrorists occupy half of Berlin, Paris or London? What would the people do? They would hope for liberation by their army. We Aleppo people waited 4.5 years for our liberation! But we had to bring that sacrifice in order to minimize the civilian causalities. We had to wait for a superpower – the Russian Federation – to help us. If our Army would have immediately started the counter attack in 2012 we might have had thousands of civilian losses and much more destruction. But we waited and we liberated our city. Thank god.